I cook steak with a cast iron reversible stove top griddle. This is simply a cast iron plate that has ridges on one side and is flat on the other. You can find them on amazon for 30 dollars. What ruins a good steak? Overcookery. Overcookery is the enemy of beef. You cannot un-cook that 20 dollar slab that you splurged on. What does not ruin a good steak? Undercookery. Undercookery can be solved easily, with little to no damage to the meat. In fact, most of the time undercookery is still really delicious. Unfortunately, in order to coax Maillard out of his grave to bless the outside of the meat, we need a lot of heat. This is a bit of a paradox, no? Beef tastes good on its own. A1 steak sauce was made for individuals who are afraid of their own shadows and char a thick steak until it is grey on the inside and hard as a brick. The only way to enjoy such a thing is to liberally dose it with sugar and vinegar, or else the tongue would probably not salivate enough to choke such a thing down. If you cook meat right you don’t need this. Sometimes I use a bit of mustard on the side, but that is usually with crappy cuts of meat that I got for a deal. I season beef liberally on both sides with fresh cracked pepper (way more than you think you need) and sea or kosher salt (also way more than you think you need). Many would argue that “seasoning” something only involves pepper and salt, and I wouldn’t dissagree. You do disservice to a good cut of meat by masking it in anything else. Pepper and salt enhance flavor, wheras paprika, garlic, cumin, whatever else you are thinking of right now ADD to flavor. We want to enjoy this steak in all it’s glory, not transform it into another dish. This is not steak au poivre, although there is nothing wrong with that whatsoever. Once seasoned, I let the steak sit out under a single layer of cling wrap for 1 hour. Yes, without refrigeration. Yes, the steak gets into the dangerous temperatures of decay. Yes, this is what I (and you) want. I do this because if I took it out of the fridge and immediately slapped it onto a scorching hot griddle the outside would be perfect and the inside will still be ice-cold. By bringing up the temperature of the meat, everything will cook uniformly. This also allows some time for the salt on the outside to get inside the steak. I place the griddle, ribs up, (flat side if you’re cooking hangar, skirt, flank steak) across two stove top burners vertically, turn both on the highest setting, and then wait 10 minutes. If I am only cooking one steak, I still use both burners, so that heat doesn’t transfer to the cold side of the griddle, robbing my meat of it’s due glory. When you place your hand an inch from the griddle, you should be able to bear about 2 seconds before pulling your hand away in pain. It should be as hot as humanly possible. I leave it on this setting for the entire process. Prepare a timer. I almost always cook the steak on one side for 5 minutes, unless it is unusually thick or thin. The steak in the picture took 5 minutes the first side and three on the other, and it was perfect. You want the steak to sit, untouched for five minutes. You just have to let it do it’s thing. If you mess with it you start losing juice, caramelization, all sorts of delicious qualities. After 5 minutes, flip, and then go another two or three. Here is the point of no return. I almost always take the steaks off now, wait ten minutes, and then serve. But, I would recommend cutting off an end piece and investigating. If it is way too rare for you, put another 2 minutes on the timer and put them back on the griddle. 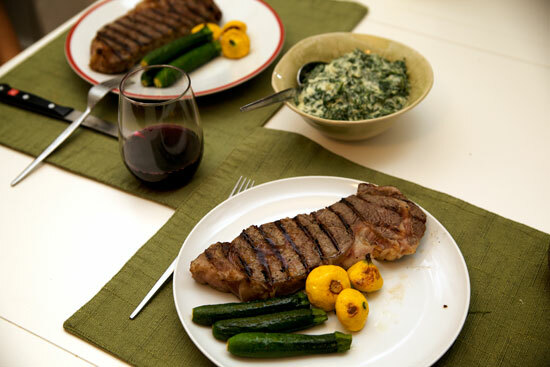 The reason you want to let the steaks sit for 5-10 minutes before cutting into them is to let the juices in the meat redistribute as it cools.